Tees: The 14-18 boys will play the Blue Tees, the 12-13 boys will play the white tees, and all girls and the 8-11 boys will play from the green tees. Registration: Inside the Willows Run clubhouse starting at 8:00am. 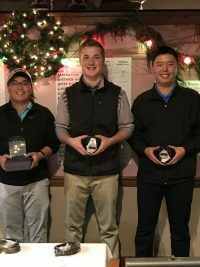 Winner in the boys 8-11 division, Jeff Seong with a 1-under 35 for 9 holes. 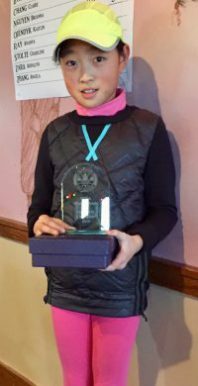 Girls 14-15 winners; Mikaela Ikeda (79), Gihoe Seo (72) and Grace Lee (72). 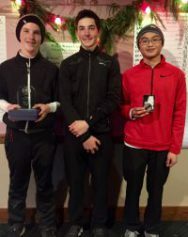 Boys 14-15 winners; Payson Atkinson (73), Kevin Hollomon (74) and Zachary Leonen (76). 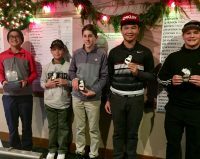 Drew Halili finishes off his WJGA career with a fabulous 4-under par 68 win at the Winter Classic! 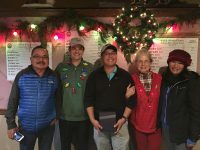 L to R; Manny Halili, Tyler Johnsen, Drew Halili, Chris Curtiss and Valerie Halili. WJGA sends great vibes to you Drew for the next “phase” of your golfing life! Job well done!